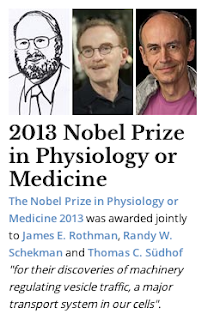 Randy Sheckman, James Rothman and Thomas Südhof have been awarded a well-deserved and long-predicted Nobel Prize for their work on membrane vesicle trafficking. I had listed this prize in 2011 but for some reason it escaped my attention this year. It's clearly important, and the kind of basic biological discovery that should have been rewarded a long time back. 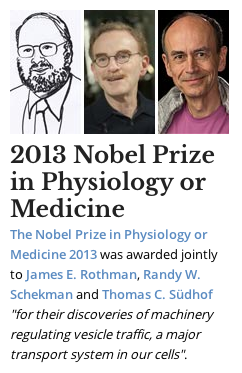 The committee seems to have split the prize rather neatly between the three recipients. Essentially Schekman found the genes responsible for vesicle formation and deployment; defective copies of these genes led vesicles to pile up in the wrong places and misguided transport of the relevant proteins. Rothman seems to have focused on the proteins responsible for vesicle fusion, using the right model organism in the form of a novel virus. He revealed the role of a number of interesting proteins like SNAP and SNARE which are now widely studied. Südhof's work was especially important for understanding neurotransmission where synaptic vesicle fusion and release of neurotransmission is a fundamental biological event. He discovered key proteins like complexin and synaptotagmin involved in this process. The medicine prize for this year also recognized individuals who could have potentially been recognized by the chemistry prize. To me this makes it slightly (although not much more) likely that the chemistry prize would be awarded for "straight" chemistry, perhaps physical and analytical chemistry. I suspect that the decisions of the various committees are not as independent as we might think, and there's probably at least some cross-talk between them. I am sure everyone is psyched now about tomorrow's physics prize.